Jonah is an interesting story - by the way, the Bible does not say he was swallowed by a whale, but a great fish. As you know, God told him to go to Nineveh, the capital of Assyria, and he didn’t want to go. God used a unique method to convince him to obey…something I hope I never have to experience! An entire city - over 120,000 people repented - when Jonah preached. Most preachers would be jumping with joy at such a great success. Not this man, he was depressed, so depressed he wanted to die. He didn’t want those people to repent, he wanted them destroyed and sent to Hell. Why? Why would this prophet of God want 120,000 people destroyed? Why did he hate these people so much that he would disobey God because he knew God in mercy might spare them? Assyria was a very cruel nation and an enemy of Israel - in fact about 50 years after this incident Assyria invaded and destroyed Israel. Jonah did not want mercy given to a national enemy. 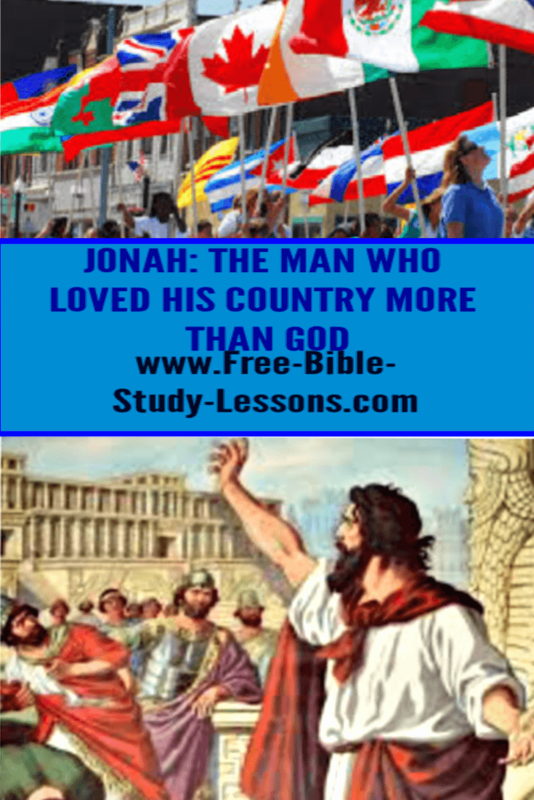 His loyalty to his nation was greater than his obedience to God. As the people of God, our first priority is the Kingdom of God. We have to look through the eyes of God Who would have all men come to repentance. Sometimes we wish destruction on personal or national enemies. Our priorities are on ourselves and our best interests. The early Christians were usually quiet and hard-working people. They were an asset to the Roman Empire. Why did the Roman Empire persecute them so harshly? Why torture and murder innocent people? It was a conflict of priorities. The Roman Empire would only acknowledge one Supreme [divine] Ruler - the Emperor. Their cry, as recorded in documents of the period, was "Ceasar is god and saviour." The Christians could not accept this. Their counter-position, held respectfully but firmly, was "Jesus is God and Saviour." The Roman Empire considered any dissent from its position as unpatriotic and treasonous. Therefore, they tried to stamp out Christianity, but attacking the Church is always self-destructive in the long run. Today many countries hold to the same position as the Roman Empire. Although Christians are an asset to their nations, they are murdered at the rate of about 150,000 a year plus the millions more who are tortured, raped, beaten, and have their often meagre earthly possessions stolen or destroyed. The nations which pursue such a policy will, like the Roman Empire, find themselves only in the history pages. As Western Christians we , like Jonah, sometimes place personal or even national issues ahead of the Kingdom of God. We get caught up in politics and the loyalties of a political party or of our nation without considering the teachings of Scripture or the potential consequences to the cause of Christ. We support our nations blindly instead of demanding that they submit to the Lordship of Jesus Christ. Christians throughout history and around the world today suffer because they will not deny the Lordship of Jesus Christ for national solidarity. Although in many areas they are supportive of their governments, and they are not in rebellion, they refuse to follow national agendas which are contrary to the Word of God. That is not to say loyalty to our nation is not important only that there is a higher loyalty in case of conflict. Jonah could not see that. To him [like some Christians today] the cause of Israel outweighed everything else. God taught him differently. It is important to know that Israel was later destroyed by Assyria only because Israel continued in unrepentant evil. If they had heeded the warnings of God to them through their own prophets, Assyria would not have been a threat. They would have had the protection of God. The greatest danger to any nation is sin within the nation, not the enemy without or even terrorists. God will look after the nation which wholeheartedly seeks Him. Are we going to be like Jonah and submit to a false patriotism, or will we demand our nations submit to the Lordship of Jesus Christ? Are we willing to be rejected by society, and perhaps even considered traitors, to maintain the crown rights of King Jesus?